Volume One, duets for alto and tenor recorders, 20 pp. Volume Two, duets for alto and bass recorders, 41 pp. Volume Three, duets for various pairs of recorders, 13 pp. Major expansion & revision December 29, 2016. Minor revisions July 8, August 26, 2017, and May 25, 2018. Volume One, Duets for alto and tenor recorders, arrangements of: 1. 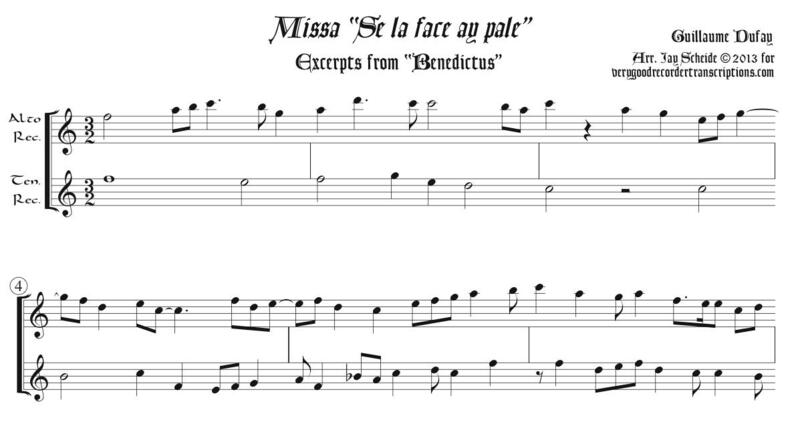 Excerpts from Dufay’s Mass Se la face ay pale (If my face seems pale). 2. “Marche de Cocagne”, second movement from Satie’s work for orchestra Trois petites pièces montées (Three Stuffed Pieces). 3. “Ging heut Morgen über’s Feld” (I went out onto the field this morning), from Mahler’s song cycle Lieder eines fahrenden Gesellen (Songs of a Wayfarer). 4. “Revelge” (“Reveille”, or “The Dead Drummer”), one of Mahler’s songs from Des Knaben Wunderhorn (The Youth’s Magic Horn). 5.“Nun will die Sonne” (Now will the sun) from Mahler’s song cycle Kindertotenlieder (Songs on the Deaths of Children). 6. “Danza española” No. 1, an instrumental interlude from Act Two of de Falla’s opera La vida breve (The Short Life). Volume Two, all for alto and bass recorders, arrangements of: 1. Part two, marked Enlevé (Charmed) and De moitié (Half as fast) from Satie’s piano duet Trois Morceaux en Forme de Poire (Three Pieces in the Form of a Pear). 2. The Minuet from Schubert’s Octet, D. 803. 3. Excerpts from Schubert’s Quartetsatz, D. 703. 4. The “Scherzo” section from the four-hand piano Fantasy, D. 940. 5. An excerpt, the second theme, from Schubert’s four-hand piano piece, D. 947, nicknamed “Lebenstürme”—two versions, one requiring the top part to switch from modern-pitch to old-pitch alto. 6. An excerpt from the second movement of Schubert’s String Quintet D. 956. 7. The second theme from the finale of Schubert’s solo piano sonata D. 958. 8. The Scherzo from Symphony No. 9, “The Great C major”, by Schubert. 9. An excerpt from the song “Zwei blaue Augen” (Two Blue Eyes) from Mahler’s song cycle Lieder eines fahrenden Gesellen (Songs of a Wayfarer). 10. An excerpt from the finale of Mahler’s Symphony No. Two “Resurrection”. 11. The ending of Mahler’s 4th Symphony, originally for soprano voice and orchestra, called, “Das himmlische Leben” (The Heavenly Life). 12. The entire third movement, “Von der Jugend”, (On Youth) from Mahler’s Cantata/Symphony Das Lied von der Erde (The Song of the Earth). 13. Étude Op. 2, No. 1 by Scriabin, originally in c# minor, transposed here to f. 14. “In diesem Wetter!” (In this Weather! ), the last of the Kindertotenlieder (Songs on the Deaths of Children) by Mahler. Volume Three, for various pairs of recorders, arrangements of: 1. Excerpts from Dufay’s Mass Se la face ay pale (If my face seems pale) for tenor and bass, or soprano and alto recorders. 2. The aria, “Höchster, mache deine Güte ferner” (Highest one, make thy goodness henceforth [new every morning]). from Cantata 51, arr. for soprano & bass recorders. 3. Excerpts from Schubert’s Quartetsatz, D. 703, arr. for soprano & tenor recorders. 4. The Minuet from Schubert’s Octet, D. 803. arr. for soprano & tenor recorders. 5. An excerpt from the song “Zwei blaue Augen” (Two Blue Eyes) from Mahler’s song cycle Lieder eines fahrenden Gesellen (Songs of a Wayfarer), arr. for soprano & tenor recorders. 6. The Minuet “al Rovescio” from Haydn’s Piano Sonata Hob. 26, arr. for soprano and tenor recorders. 7. Bahn Frei! (Polka schnell) [Make way! (Quick polka)] by Eduard Strauss, made famous in the USA in large part by Jean Shepherd’s radio show which lasted from ca. 1945-77, arr. for sopranino and bass recorders.